Most of the houses in Sutton in 1500 were single-storey buildings. The main room had a central hearth, and the smoke from the fire escaped through vents in the thatched roof. There was not much furniture - benches and a table, and a bed with curtains perhaps; chairs were a rarity. Fifty years later things were changing - Bishop Vesey had provided fifty-one stone houses, each with a chimney against the wall, taking away the smoke so that the rooms at the top of the spiral staircase were smoke-free. Timber-framed thatched houses were still common in seventeenth century Sutton, but now all had chimneys, ceilings, and upstairs rooms. Thomas Bassett’s house consisted of a hall, two parlours and a buttery downstairs and two chambers upstairs. The best bed was in the larger chamber, with an old bed in the parlour downstairs. There were cupboards, coffers, tables, stools and benches, none of them worth much, but comfort was provided by five chairs and seven cushions. This was in 1686, when all the furniture was made of oak, and chairs were heavy and cumbersome. Bassett’s house was larger than most, but he was bankrupt when he died, and his furniture was valued at only £7; the furniture in a wealthier man’s house was valued more highly. Joseph Powell, who lived in a six-bedroom house, had furniture to the value of over thirty pounds, including three handsome beds, wall-hangings and table cloths, seventeen chairs and lots of cushions. Joseph Powell had a variety of chairs. The two joined chairs and two flag chairs in the hall were used for sitting at the two tables there, while the six leather chairs with their six cushions in the parlour were for more relaxed use. The rest of the chairs were in the main bedroom - two leather chairs and four rush-seated chairs (the rush chairs were probably the same as the flag chairs, flag being another word for iris). 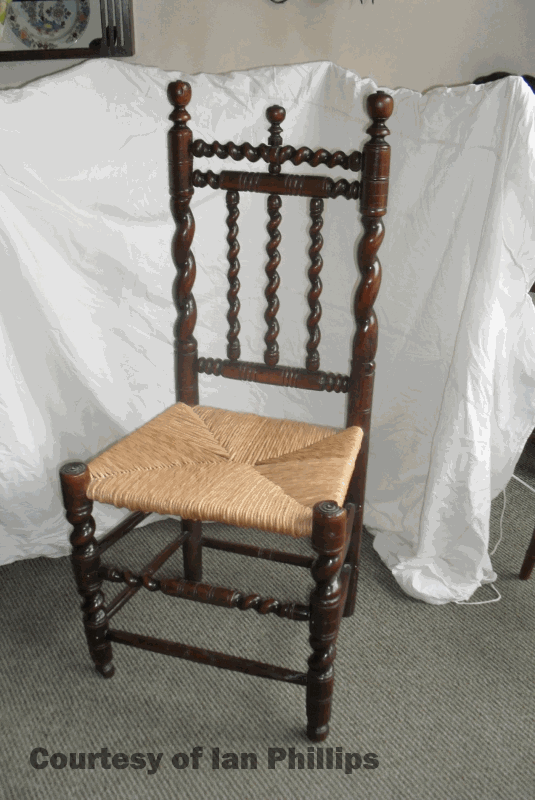 The last chair was also in the main bedroom, described as “one old chair”, so perhaps the rest of the chairs were fairly new. All these chairs were probably made of oak, possibly by local carpenters, but more likely by more highly skilled craftsmen such as the specialist chairmaker Francis Roson who had a workshop in Sutton. Joseph Powell was wealthy enough to afford good quality chairs, perhaps as well-made and elaborate as the ones illustrated. 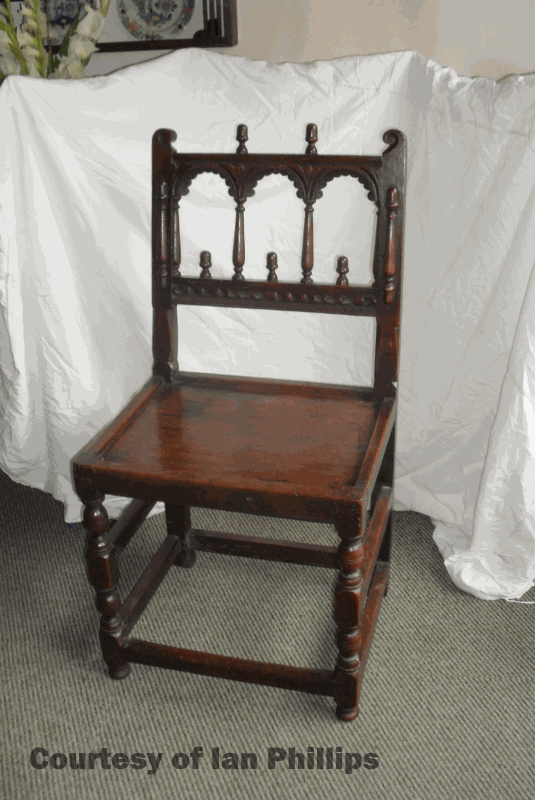 A seventeenth century joined oak chair with turned decoration and a recess for a cushion.